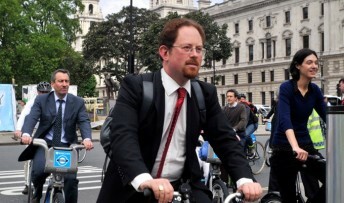 The government must take the lead in implementing a national cycling action plan as part of Britain’s Olympic legacy claims MP, Julian Huppert. Cycling organisations have called for the plan to increase cycling and reduce the actual and perceived risks of cycling. Julian has urged the government to provide the leadership, resources and Cabinet-level co-ordination across all departments and with outside partners to produce and implement the plan. It should include measures to strengthen road traffic law and its enforcement, improve cycling conditions and integrate it within public transport. Cycling should be promoted in schools, colleges, workplaces and beyond and it should be at the heart of transport, planning and other relevant policies, he says. Julian makes his call to government in a Commons’ Early Day Motion which notes the benefits cycling brings to health, the economy, the environment and quality of life. His EDM comes after Parliament gave its support to The Times’ Cities fit for Cycling campaign which was supported by Julian in a Westminster Hall debate. Julian is also leading an All Party Parliamentary Cycling Group inquiry, Get Britain Cycling, which will look at a range of topics including safety, traffic law and enforcement and behaviour change. The inquiry will report is findings in April 2013. Julian said: “We have made so much headway in promoting cycling in such a short time but it is crucial that we keep up the momentum. “The government has the opportunity to show real leadership on this issue and bring together organisations across the country which can help to showcase the benefits of cycling to every age group. At the same time, we need year-on-year investment to improve safety and give cyclists the respect they deserve from other road users.